The touring packing list is a procrastinator’s dream – a balancing act of durability, weight, destination, duration, climate, comfort and personal risk profile. There’s bonus hours to be spent swapping out gear and clothes from your base packing list, depending on whether the next trip is a summer bikepacking overnighter or a transcontinental. I’m a light tourer at heart but with a safety margin for remote country to avoid the embarrassment of sitting on the roadside batting eyelids of helplessness. For the Nullarbor, I added some discipline to the packing list process by turning the packing list into a spreadsheet of weights, with the help of postal scales. It’s one of my best decisions. Accurate weights for each category made a rapid cull easy, then highlighted areas needing work and guided purchases of new gear. Who knew cheap camp crocs were lighter than thongs? While the list was useful to account for necessities like water, the alarming weight category was luggage – stuff you can’t eat, drink, wear or keep your bike running. Sure, it carries gear and hopefully keeps it dry, but it can add kilos of dead weight. Worse, the common solutions like racks and handlebar bags breach my ideal of dual-purpose gear. Like a base layer that works as day wear and sleepwear and riding top with rare washing. Top of the list would have to be ZPacks’ 20F sleeping bag. The long term average minimum temperature for our route was 6C but the nights could get very cold, so I wanted a bag that was light and warm. At 5’1″ and a bit I’m compact so most production bags were too long, too heavy or too cold. I went looking for one that was juuuuuust right. 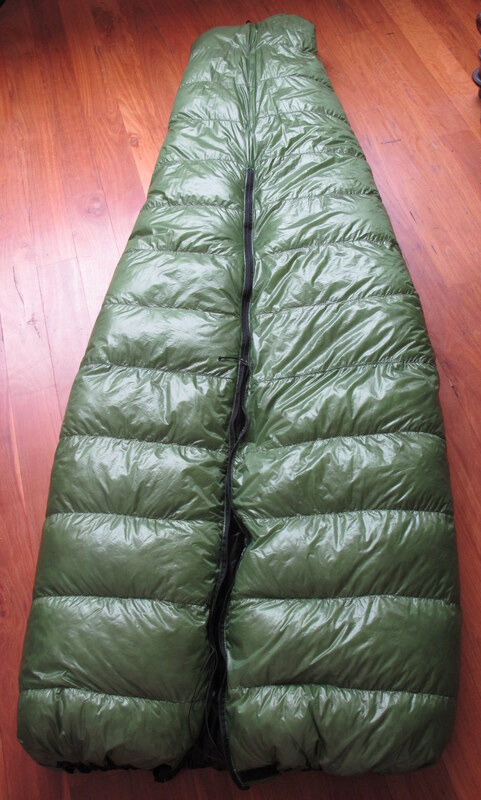 The ZPacks bags seemed to fit the bill – over-stuffed 900 fill power goose down with Cuben fibre baffles, very light, compressible and tailor made for length, width and temperature – bliss. They’re a bit more expensive than some production bags but way in front on warmth for weight. I considered the 30F bag but eventually opted for comfort with a short 20F (-7C) bag and pillow/stuff sack. At the time, ZPacks had a long wait list so I was a little concerned about timing but Matt and Joe slotted it in to production to allow for international posting. Communication was excellent. The bag arrived in good time and the weight was accurate at 489 g for bag and pillow/sack. It passed the couch test and the overnighter test. It’s so light that if you lift it up, it descends softly like a parachute. Initially I wasn’t too keen on the black lining – I’d prefer to see any crawlies – but it proved useful under caravan park lights and at dawn. The light elastic drawcord at the top was easy to use half asleep and I barely noticed the flat zip. I threw a warm jacket over my hips a couple of nights and wore a beanie quite often but I was generally warm and comfortable (but often wearing light wool). The pillow stuff sack was good too. The roll top allows some compression of the sleeping bag, and when reversed and filled with clothes the fleece lining made a comfortable pillow I didn’t have to chase all night. I also bought a Cuben fibre ZPacks Multi-Pack (below, 86 g with all straps) for use as a handlebar/handbag. I think the ZPacks description of it as water resistant (rather than waterproof) is accurate. With sustained rain it got damp inside but I just moved the phone to a pannier. I wanted some capacity to carry luggage up front but width is limited with 38 cm drop bars. So I made a simple harness of webbing and buckles and wrapped any load in the cut-down emergency blanket that serves as a tent footprint. The sling and footprint cost around $15 and weighed under 300g. One buckle (from an old backpack) broke when cinching the straps one morning but I had an emergency buckle so it was easily replaced. I generally carried my sleeping mat (Exped Synmat UL7 S) up front together with extra water if needed, with the Multi-Pack on top (as above). With such a small bike and cantis I need to keep the load either high or light so it doesn’t pressure the front brake main cable. 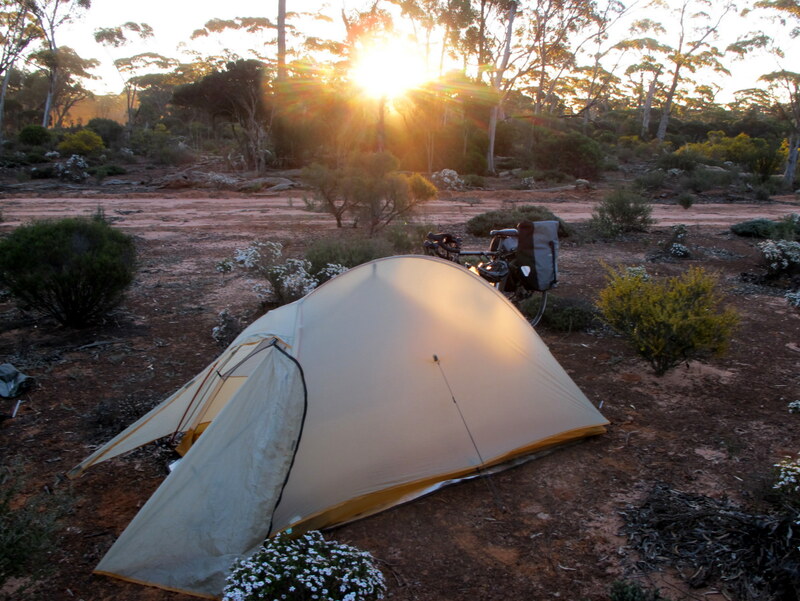 Like the ZPacks bag, the freestanding Fly Creek UL1 tent just worked. Fast up, easy down, in rain and gales I stayed dry. The whole kit – extra pegs, sand stake, stake/tent bags and repair kit – totalled 1118 g.
There’s some easy weight savings even among these few things if need be – spare stakes and bag, extra straps for the Multi-Pack and so on, so it becomes a matter of convenience and redundancy. Bike touring gear lists vary with tour type, duration, climate, location and personal risk profile and preferences. Some people are happy to sleep on bubble wrap while others pack a coffee machine. And you’ll likely pack differently for a credit card tour of French patisseries versus the Tour Divide. 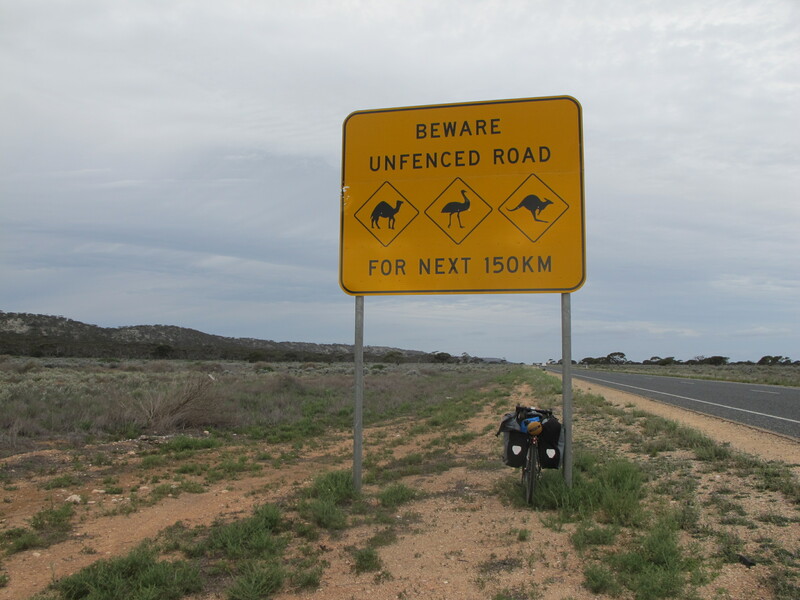 Our trip across Australia meant five weeks on the road with up to 300 km between water points (let alone bike shops) so we had to be self sufficient. But I wanted to travel light – certainly much lighter than the (heavier, stronger) men whose gear lists dominate mainstream bike touring. And don’t forget that sometimes you’ll be pushing that weight into a roaring headwind, after a couple of weeks without a rest day. 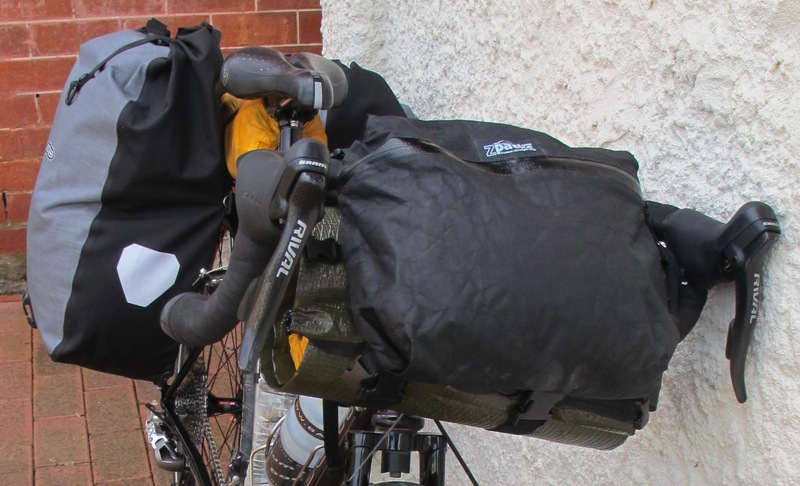 As a result, the gear list (download below) became a fluid balancing act of safety, durability, weight, comfort and cost – more comfort and safety margin than the ultralight crowd and overnight bikepackers but lighter than traditional four-pannier touring. Possibly the most useful thing I did for this trip was turning the packing wishlist into a spreadsheet. It has a few categories – clothing, spares, food/water, camping gear – with weights from the kitchen scales and a running total. Changes were easy to make, the weight savings from changes gratifying and it provided the discipline to cull luxuries and guide choices. I would have ended up heavier without it. A couple of things that seemed reasonable initially were dumped immediately I saw a total weight, while little things like which multi-tool to take were also influenced by weight. Category totals also flagged the weight of storage/luggage like panniers and handlebar bags. You can’t sleep on it, wear it, ride it, eat it or drink it but there’s kilos of it! If you’re conscious of weight, I’d highly recommend a spreadsheet with weights to hit you in the nose. Beyond that, I found three approaches worked for lightening the load: choose a lighter alternative, make things dual purpose, or just leave it behind. 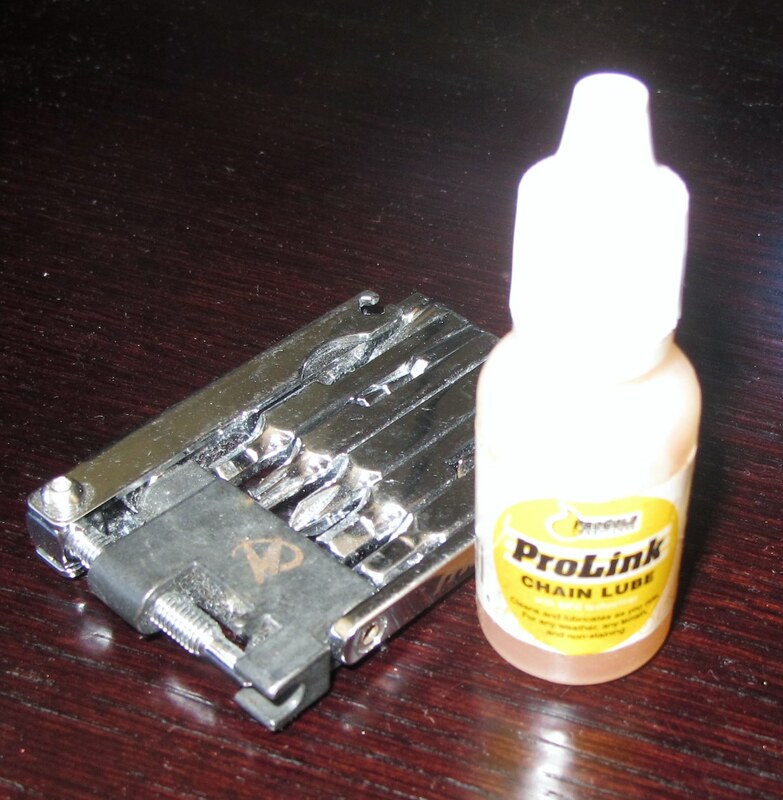 I found a tiny 15 mL (trial size) bottle of ProLink chain lube at the wonderful Abbotsford Cycles; much smaller and lighter than regular bottles. I shipped a second bottle in one of our food parcels, and used both. 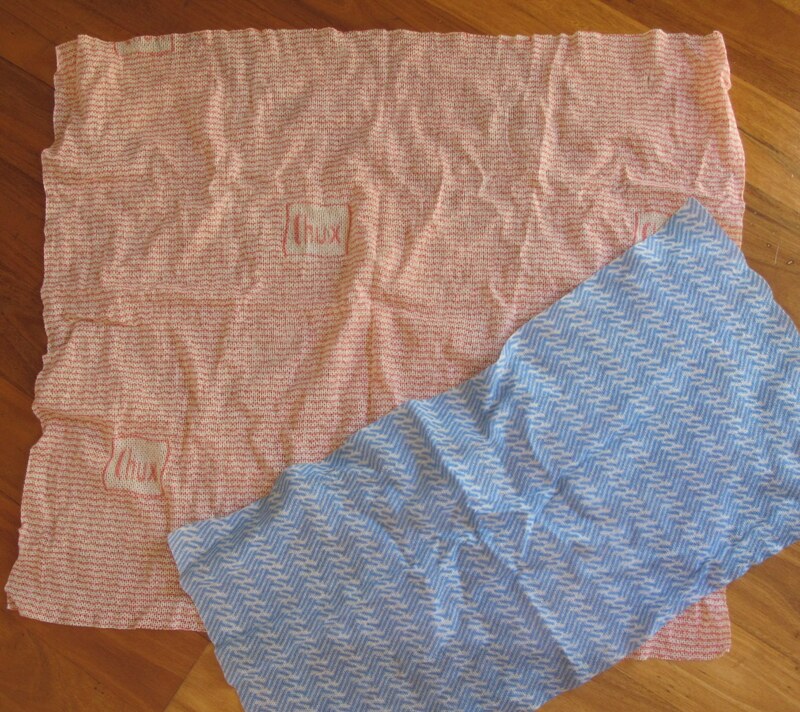 A contact lens case was handy for a smudge of grease, croc-style camp shoes were lighter than thongs and kitchen towels replaced a travel towel.That’s a towel and bath sheet below (and rags if need be). I could have left out the camp shoes but they became one of life’s luxuries, and useful in the middle of the night for short walks. I initially thought I’d be taking a trowel for camp use. But decided while musing in an outdoors shop that a sand stake could work just as well. Plus I’d have a sand stake, and a spare stake. So I got a light alloy sand stake, smoothed the sides with an emery board for comfortable digging, and deleted the 165 g trowel from the list. That’s dual purpose. I also cut down a laminated emergency blanket to do double duty as tent footprint and waterproof wrap that contained and stabilised any load in my handlebar sling. (And maybe catch water if need be, and signal with the shiny side.) 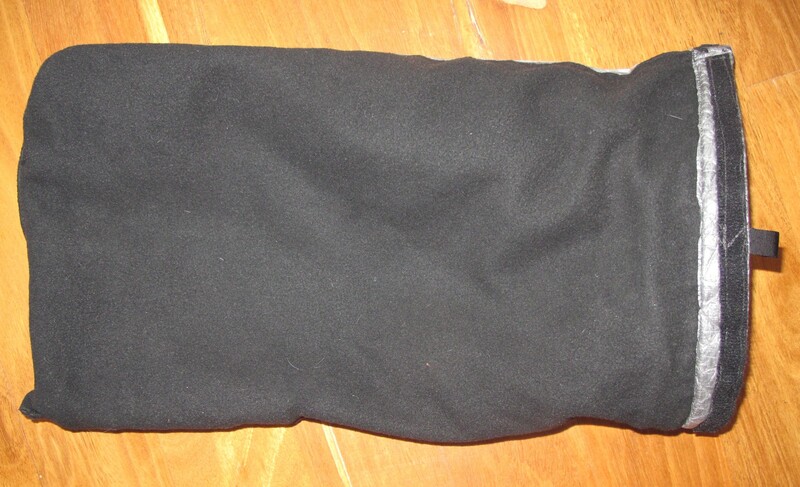 The sling often just carried my sleeping mat, but sometimes also the sleeping bag or extra water, so the footprint served as a stiff wrapper that didn’t increase overall weight. I still have a reflective windscreen panel that would do much the same job, but it would be flashier on the bike. Tyvek and Cuben Fibre are worthy footprints too – if you need a footprint at all – but they don’t offer the extra warmth of the reflective emergency blanket and stiffness of this one. Just leave it at home. Many items on my initial wishlist met this fate and I didn’t miss a thing. A front rack, front panniers and regular handlebar bag could cost me around 2.7 kg – huge compared with my goal weight. So I made my own handlebar sling (my little bike is too small for Alaskan bikepacking goodness like Revelate Designs) and coupled it with a Zpacks Multi-pack as a quick-release handlebar bag/handbag. A total 159 g versus 2.7 kg. Win! I went heavy on a couple of things though. For five weeks, I figured I would value real utensils rather than a spork, as well as a mess bag. I’m glad I did. It just saves looking for stuff when all you want to do is eat and relax. 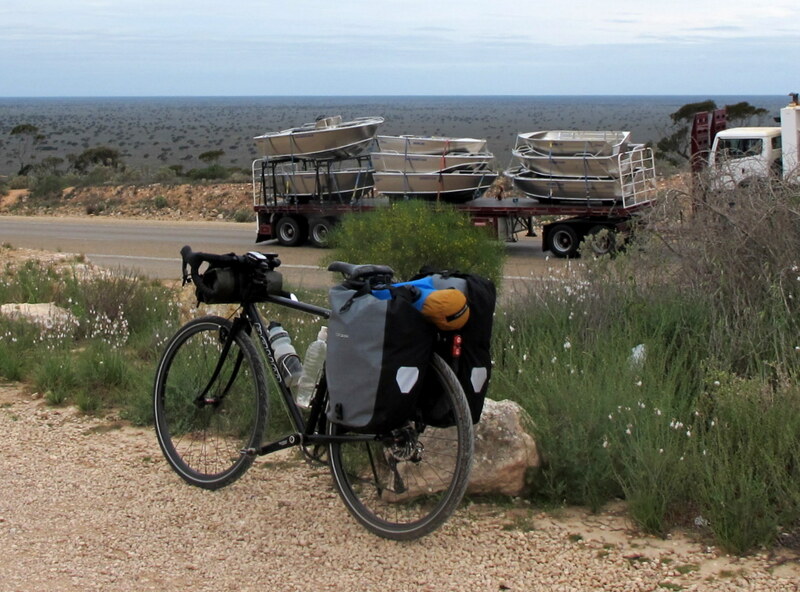 You can download and edit my gear list to your own needs here: Nullarbor cycling gear list [Excel 33 KB]. My ride buddy Jan carried the stove and pot, while I had our bike spares and tools – the benefits of sharing weight. Food weights are approximate but a fairly accurate maximum at each of our re-supply points – roughly weekly from Perth to Adelaide and a little lighter thereafter as you roll through a town at least daily. Because of the distances involved, we mostly carried dehydrated food for breakfast and dinner, and had rolls or wraps for lunch, or bought lunch along the way. My maximum water load was 10 L but we often carried 4-5 L.
Most things worked great, but I didn’t like the taste of water from the Ortlieb bag, and after a day of the worst flies I have ever experienced, I would recommend a fly net for this trip. Sadly, the wires on my Power Monkey solar panel broke before Norseman so I didn’t have solar power. It’s slow anyway but it made me more diligent about recharging whenever we stayed indoors. No dramas with the Garmin or phone (which is pretty useless anyway on the Nullarbor, even with Telstra).